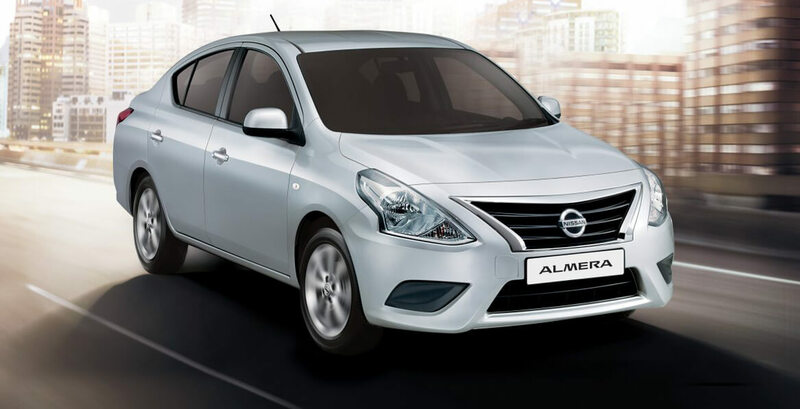 Derived from the Spanish term for a large diamond – “almendra” – the new Nissan ALMERA is a global car for Nissan which exudes a youthful image and Mediterranean atmosphere. A smartly-packaged, brand new sedan which boasts affordability, top-class comfort and space with eco-friendliness and clever engineering. The attractive, modular interior design is ergonomically sound with high perceived quality and textured surfaces geared to creating a relaxing and comfortable driving environment. Dashboard surfaces have been manufactured with an evolved texture design which is geared to reduce glare from sunlight into the driver’s eyes as well as windscreen reflections. The new Nissan ALMERA features sculptural design elements with muscular overtones, while maintaining a smooth form with curvaceous nuances. The strongly-focused, sporty headlamps introduce the vehicle and are flanked by a powerful, large, chromed grille which adds both presence and might. The sporty side profile includes attractive 15-inch alloy wheels, a coupe-like window profile and smooth surfaces. A pronounced design crease which runs from front- to rear bumper also expresses character and spirit, forming a high waist line. The rear of the new ALMERA features distinctively large tail lights which wrap around into the flanks. The smooth-edged rear bumper is neat and fuss-free, framing the rear with a smart look. All design elements have been implemented with aerodynamic efficiency built in as well. The new Nissan ALMERA is available with a 1.5-litre petrol engine. The 1 498 cc unit produces a healthy 73 kW of power at 6 000 rpm and 134 Nm of torque at 4 000 rpm. The low-emission and efficient engine allows the five-speed manual version of the new Nissan ALMERA to achieve average combined cycle fuel economy of 6.3-litres per 100 km, the four-speed automatic variant achieving 7.2. Carbon emissions for both models are 149 g/km and 171 g/km respectively. Made up of a collection of active and passive safety systems, the new Nissan ALMERA features a Safety Shield, Nissan’s concept of ‘the vehicle that helps protect people’. Safety equipment comprises ABS with EBD and BAS, with backup in the form of two airbags, five three-point seat belts and a zoned body structure whereby the passenger compartment features high-strength construction. Specific attention has been paid to the seatbelts, which now feature a reduction in pull-out force of approximately 10% and softer webbing for increased comfort during use. Other safety equipment includes ISOFIX child seat anchor points, a third brake light and an immobiliser.